If you've never read a Susan Miller monthly horoscope forecast, perhaps it's time you did. Susan Miller is a well known astrologer who is read internationally. Her horoscopes can be found in print and online, and she has made appearances on many television programs. Astrology is a tradition in the Miller family, and Ms. Miller initially learned the art as passed down to her from her own mother who she affectionately refers to as "Little Mom". Miller's mother was initially doubtful that her daughter could turn her interest in astrology into a full-time career, but eventually gave her blessing. Susan Miller's monthly horoscopes have found such wide spread popularity because they offer common sense, usable information in an easy to read format. Ms. Miller begins each sign's forecast with a small carry over of information from the prior month to provide continuity from one forecast to the next. She then proceeds through the upcoming month noting the highlights that will most affect your daily life. She offers info on the position of the planets, including the sun and moon, in your various houses, and goes in depth to explain the kind of influence each particular planet brings. Finally, she offers a summary of the forecast that includes a brief review of your key dates for the month and what you can expect to encounter. This makes it easy to look back for a quick refresher. 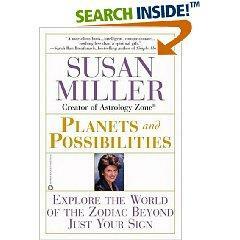 For each coming year, Susan Miller compiles a wealth of astrological information into one very concise wall calendar. You'll find an overview for the year as well as monthly information on each zodiac sign. Ms. Miller highlights the particular aspects that will be in effect on any given date. Information on the retrograde period for Mercury and the other planets is also included. You can use this information to help you plan anything from your wedding date to the perfect day to ask your boss for a raise. Information for January of the following year is also included as a bonus. The calendar is meant to be used in conjuction with your in depth monthly forecasts. The calendar can be ordered through Astrology Zone.com. Once you've read through one of Susan Miller's monthly horoscopes, it's easier to understand how useful a longer forecast can really be. Having an idea of what to expect each day is helpful, but looking ahead at the bigger picture allows you a better chance of avoiding pitfalls and making the most of the opportunities coming your way. If a month looks particularly good, you can relax and go with the flow. If it looks like a less than fortuitous forecast, you can plan on being extra careful. Knowing when to expect ups and downs definitely has its advantages, and Susan Miller's forecasts will give you that edge.